Happy May! When is the best time to visit our showroom for new arrivals you ask? This weekend!! We are stocked full of new pieces to the store!! Browse below, then stop by Monday-Saturday, 10AM-6PM at 2237 NW Raleigh St, give us a call at 503.222.6122 or email us at home@seamstofit.com with any questions. Remember Seams to Fit Home lovers; we cannot feature all of our items here, but we do feature additional gems on our Instagram and Facebook pages. Make sure you follow us, so you are up to date with other fabulous items: http://instagram.com/seamstofithome or https://www.facebook.com/seamstofithome. A sleek chocolate brown leather sofa by Italsofa features tufted leather seats and a chrome metal base. It measures 80″w x 37″d x 34″h, and we have it priced at $1500–SOLD. In a saturated brick red chenille, this ‘Westwood’ sofa from Thomasville has gold piped trim and a pair of custom silk-patterned throw pillows. It measures 84″w x 33″D x 31″H, and we have it priced at $2300–SOLD. 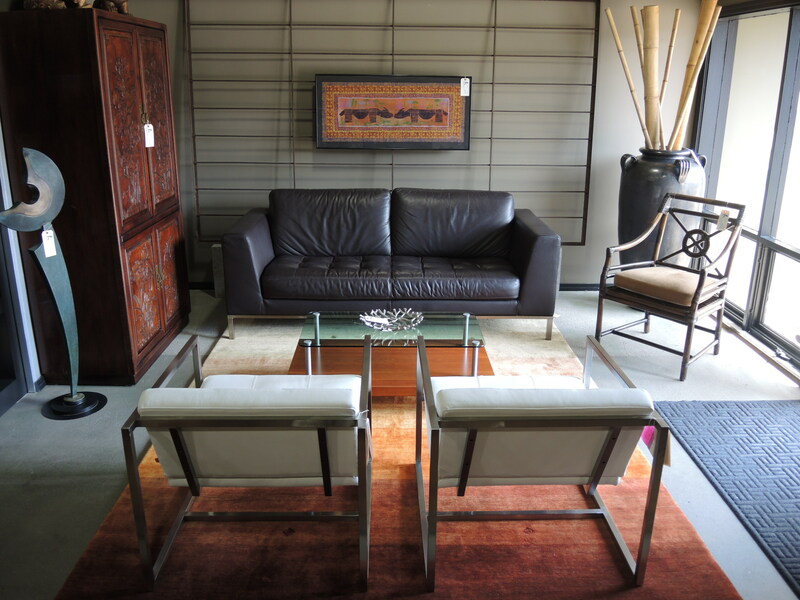 The lounge chair at the left features a matching lumbar pillow, gold silk upholstery and an espresso-wood frame, priced at $595–SOLD. 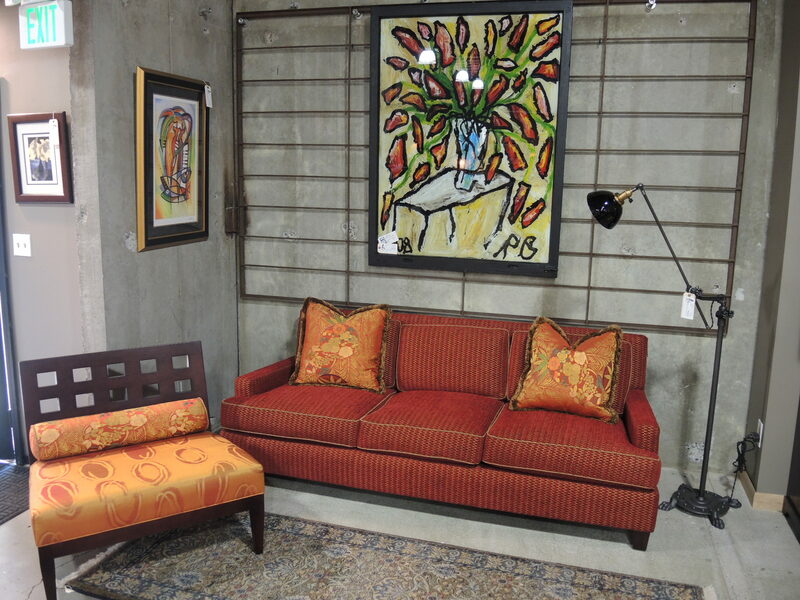 An iron pharmacy lamp from Rejuvenation Hardware lights up the scene ($450–SOLD), and an original Ryan Birkland acrylic on glass painting draws the eye up ($995–SOLD). 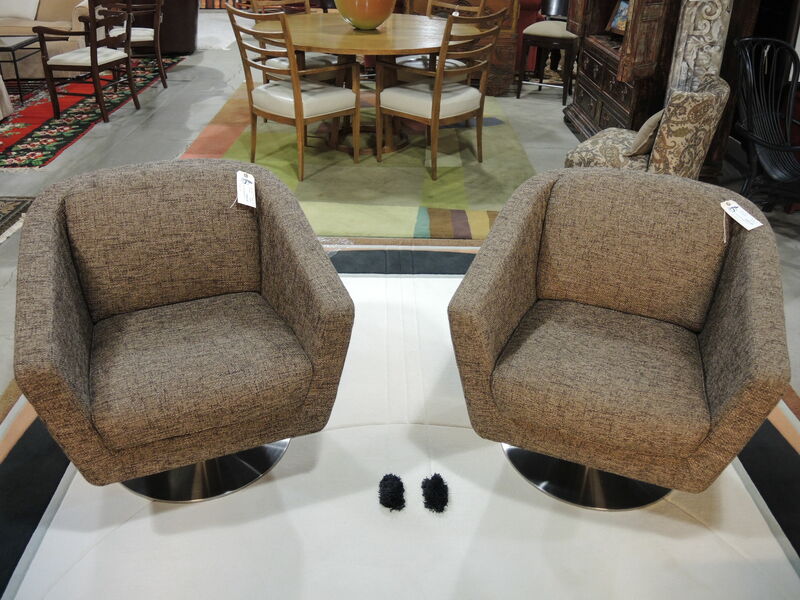 A pair of smart taupe tweed upholstered swivel chairs with solid chrome bases and fixed cushions. They measure 31″w x 32″d x 31″h, and we have them priced at $695 each–SOLD. 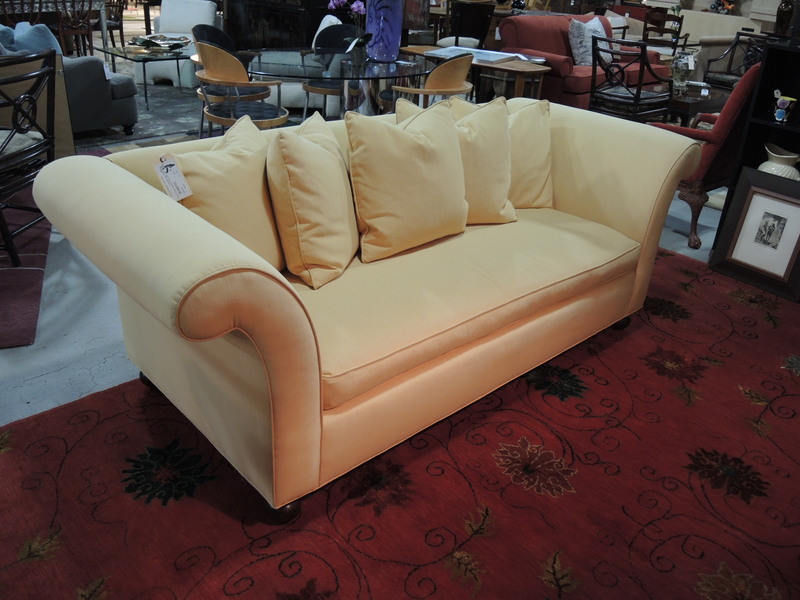 Beautiful custom butter-yellow sofa from Versailles in the Pearl with a simple bench seat, loose cushion back and lovely flared arms. 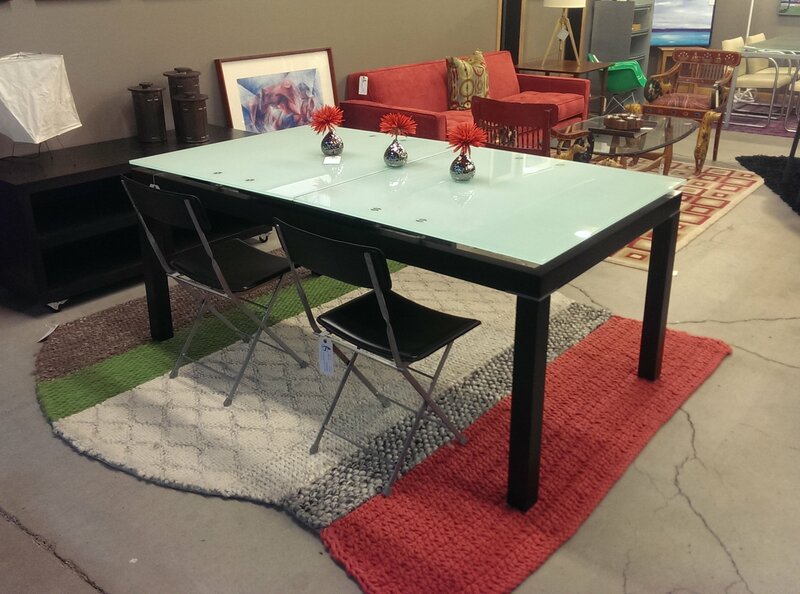 In exquisite condition, it measures 87″W x 35″D x 17″H, and we have it priced at $2000–SOLD. Adding rich color from the floor is a hand-knotted Tibetan ‘Lotus’ rug woven with Himalayan wool and Chinese silk. It measures 9′ x 12′ and is priced at $4500–SOLD. 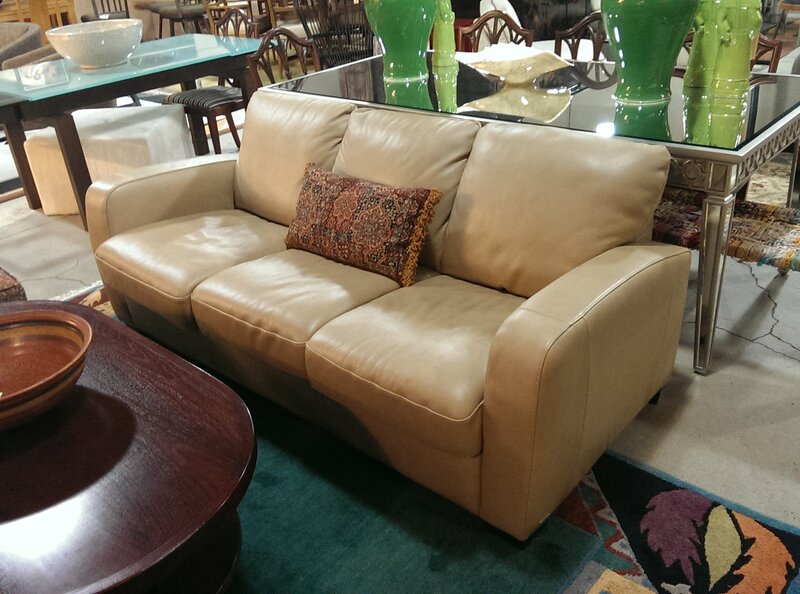 Beige Italian leather Natuzzi sleeper sofa with track arms and three cushions. Measures 78″w x 32″d x 34″h, priced at $1100–SOLD. Contemporary ‘Denali’ frosted glass extension table with a dark walnut finish originally purchased from PH Reed. It measures 71″w x 39 1/2″d x 30″h with a 21″leaf, and it is priced at $795–SOLD. 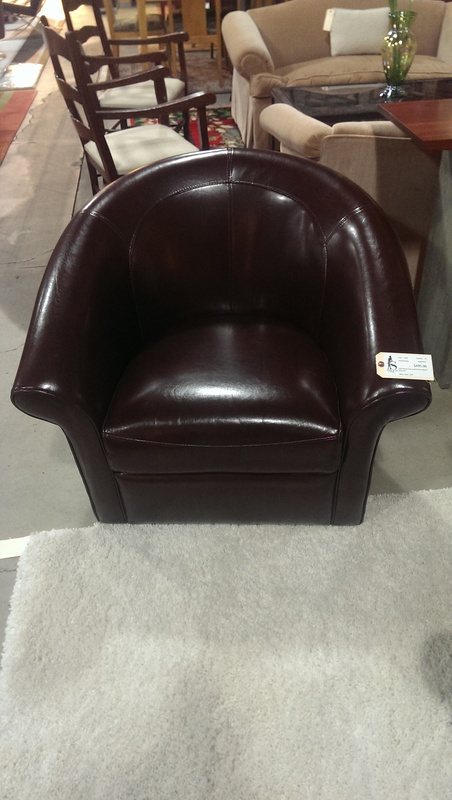 A handsome pair of chocolate brown faux-leather swivel armchairs, measure 35″w x 24″d x 30″h, and are priced at $495 each–SOLD. I love receiving your photos! Am in the market for a few more pieces, so hopefully will see them posted one of these days. In the meantime, I’ll stop by when in your “hood”! Thanks for your kind words! We hope to see you in the showroom in person soon! Have a wonderful weekend!